Canada Day is coming up on the First of July. Our Paper Twirlies team of paper quillers on Etsy is hosting a contest to use patriotic colours this month in preparation for the celebrations. (America’s Independence Day is the Fourth of July.) For this contest, I decided to incorporate Canadian elements by using – of course! – red and white which are the colours in our National flag. Also, I used a French language sentiment since French is our second National language. To incorporate a celebratory theme, the card is a wedding cake card that reads “congratulations” on the front. It could work for an anniversary card too! The tiered, quilled cake is topped with a red bow and sprinkled with red roses. The side of the card is scalloped so the last red strip is actually on the inside of the card for some interest. This is my first contest entry for the Paper Twirlies team. To learn more about us, please visit our blog! What do a hundred i's look like? Look closely! There are 100 little letter i’s in this baggie! My very first custom order is for a baby’s christening. The word christening has two i’s in it and, although the order is for 45 cards, I’m cutting 50 in expectation of a few “oopsies”. It’s the first large order I’ve ever had and it’s half-way around the world in Australia! I couldn’t ask for better exposure. 45 people are going to see my cards! And, let me tell you, this new mommy has got it going on! She contacted me back in March. With being a Chartered Accountant and having Canadian tax season through to April 30th, I was sure I could not service such a large order. However, her event is not until October! Wow, she’s organized! I have all the little bits cut (that’s 550 letters among other things!) and I did it all with my manual die-cutter: one by one. There are two things left to do: the bears and assembly. The first bear is done and soon I hope to have a whole army of them! Of course, I can’t show you the whole card – that might spoil it for the guests! iCraft.ca is a Canadian based, handmade goods commercial website. Artisans from Canada and around the globe offer their handmade wares for sale to buyers worldwide. As this venue is still fairly new, iCraft is hosting a Seller's Bootcamp program created by an iCraft seller and run by a host of volunteers. As part of this promotion, the Bootcamp gang has listed a number of coupons, en masse, through IndieSmiles which is a website that lists the various discounts and coupons available from independent artists to bring handmade goods to the public at the best possible prices. NOW is your chance to see these movers and shakers in action! Get your IndieSmiles iCraft Seller's Bootcamp coupons today through this link! 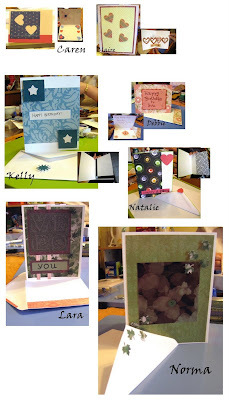 This Saturday marked the FIRST Card Workshop for Charity this year! Southern Ontario Animal Rescue benefits from half the class fee and a portion of the kit sales too! The grand total for this round was 7 participants and $42.50 raised! This workshop's theme was "Doubly Delicious!" We learned the benefits of using double-sided papers and even tried a new technique: inking. This first card shows the inking technique. 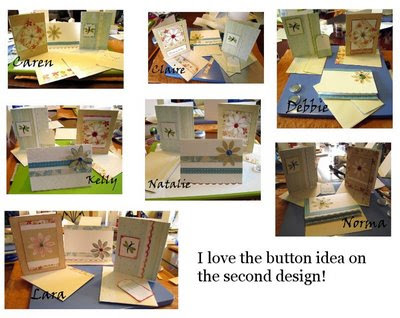 Our second card also makes use of both sides of the patterned paper and the negative of a die-cut. Double –sided paper always make a perfect match! And LOOK! The cut out from our die-cut in the second layout was then used on our third! Double duty! This time, when I was cutting up the kits, I had some strips of the patterned paper left over. The scrapper in me likes to use every last scrap whenever possible in true *from scraps to smiles* fashion! So, I decide those strips would certainly spruce up the envelopes and make our cards in to a nice set. For one set, I also threw in a gift tag. The participants had a great time making the designs their own. Although everyone had the exact same kit, these are all the variations that came out of them! But we weren’t finished there! BONUS ROUND! I numbered some themed challenges, took a random number, passed out a blank card base and all my scraps and said: HAVE AT IT! The workshop participants went to work. We had an alphabet theme with the letters Y and P. Most cards had the word “you” for “y” and patterned paper and punch-outs for the letter “p”. The varied designs that can come from the same theme and a few scraps are always an interesting potpourri. Bonus round participants got their names in a hat and the winner received a Mango & Melon bar of handmade soap from Carvel Country Soapworks. This soap is very gentle and smells SOOO good. Congratulations, Norma! I was tempted to keep the soap for myself and maybe tuck it in a clothes drawer so that all my things could smell as sweet! Alas, that would not be very effective publicity for my fellow handcrafters! All the extra kits sold out so, all in all, I’d say the workshop was a success! In or about the year 2001, I was introduced to scrapbooking at a Creative Memories party that a co-worker hosted at work. Then, one day, I wandered in to a local scrapbook store and was introduced to Quickutz – a die cutter company. As I returned there to check out the new dies, I slowly built a stash of other scrapbook company supplies and expanded to brads, buttons, ribbons, and more – oh my! I am totally hooked on die-cuts. However, being the weakling that I am, I found the original Quickutz squeeze tool difficult to use. Another local scrapbook store suggested I try the (then new) Boss Kut. It fit the original QK dies and was far easier on me. Today, I have a Boss Kut Gazelle, their electronic cutter. I’m still in the learning curve phase, but I’m enjoying its abilities! In 2005, I stumbled upon the popular scrapbook message boards attached to the online scrapbook shop “Two Peas in a Bucket”. I was floored! There is SO much information on this site and SO many layouts added daily to the galleries that I felt like a nincompoop by comparison. I had no clue about the full range of scrapbook products and companies that existed, the styles, or even the alterables and mini-projects. Hence, Scrapninny was born! I always thought that, when I was “good enough” or “worthy”, I could change it to ScrapSage. Well… that hasn’t happened yet and I’m not sure it ever will! So, if you want to know what a Scrapninny is, it’s ME! This blog will cover all things related to my scrapbook adventures! I will muse over products and trends, present some of my designs, and maybe interview others! It is just one more extension of my paper trails. Hope to see you back again!